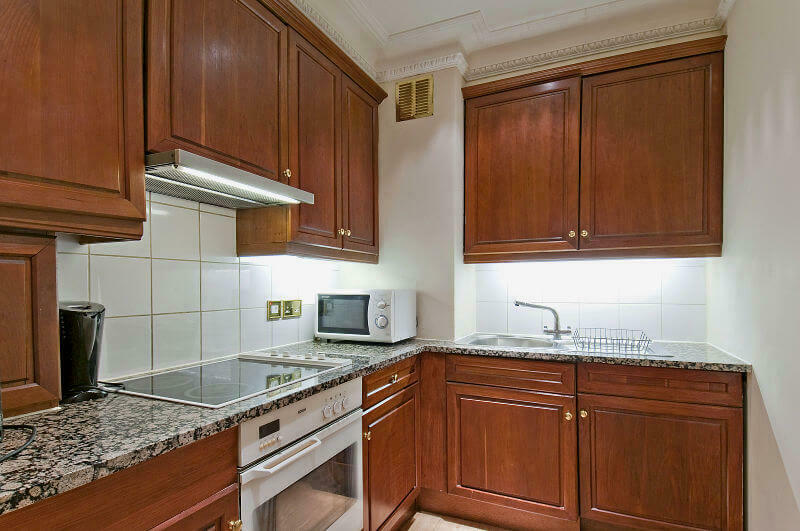 Carlton Court has two one bedroom serviced apartments in Central London in Down Street which is in the centre of Mayfair. It is within walking distance of Piccadilly, Oxford Street, Park Lane, and Knightsbridge, so the very finest shopping is on your doorstep. Hyde Park is just across the way, so you can go for an early morning walk, take a picnic, or you can even go riding with a horse from the stables in Rotten Row. These one bedroom serviced apartments really do put you in the lap of luxury. The building has 24 hour security/concierge service, and the staff are multi-lingual. The penthouse apartment sleeps two people and has high speed broadband, the very latest Sky HDTV’s, and has around 2,000 satellite channels relayed in English, Hindi, Arabic, French, and Russian to name just a few. Housekeeping/maid service 7 days a week means you don’t even have to make the beds. There is air conditioning for the summer (it can actually get quite hot in July and August) and underfloor heating for the cooler days and nights. When you arrive you receive the Carlton Court Welcome Pack to help you settle in quickly, and at breakfast time we provide you with a breakfast hamper with teas, coffees, cold drinks, fresh milk, cereals, freshly baked bread, preserves, and fresh pastries to get your day off to a good start. In Down Street you are right at the heart of the metropolis so you can go to the theatre, visit some of the finest restaurants in the world, pop out to have a drink in one of the numerous bars and English pubs, or just sit back and watch TV in the evening if you don’t feel like going out. The furnishings are the ultimate in luxury. The apartments have been furnished by the owners with no expense spared, and they made their choices as if they were going to live in them themselves, so you can guarantee that absolutely everything is of the highest quality. The apartments are available for as little as £250 per night, depending on the season.